In order to expand the work and impact of Simply Smiles on the Cheyenne River Sioux Tribe Reservation, the Dakota Association of the United Church of Christ has leased Simply Smiles just over 8 acres of their land for a term of 99 years! On this property (adjacent to the Sam D. Horse Community Center property in La Plant, South Dakota on the Reservation, where Simply Smiles currently runs its programming), we will build additional infrastructure that will work in conjunction with the Community Center property. This expansion will increase our efforts, grow our partnerships, and allow us to work each day to create the smiles that lead to the brightest possible future for the children of Cheyenne River. A bright future: Outlined in orange is the 8.04-acre parcel of land, leased to Simply Smiles by the Dakota Association of the United Church of Christ on June 1, 2018. To the right, you can see the La Plant Community Center. Simply Smiles has put down our roots in La Plant, South Dakota. This is the town that welcomed us onto the Reservation almost ten years ago. Now, as we solidify our commitment to the Reservation and to Indian Country at large, we also solidify our commitment and our gratitude to the town of La Plant. As you can imagine, entering into this lease was a lengthy and at times complicated process. We couldn't have done it without an amazing team that worked together for over two years toward a shared vision for Simply Smiles on the Cheyenne River Reservation. The Congregational Church members who live in La Plant and helped Simply Smiles to connect with, and develop a relationship with, the Dakota Association. Simply Smiles donors and supporters! This is great news! When will Simply Smiles start developing the land? In the coming years, Simply Smiles will incrementally add the infrastructure we need to the land. We’ll add utility connections and driveways first, then buildings for storage, housing, program implementation, and more! In the immediate future, you may see a Simply Smiles staff member on the land parcel putting in corner markers and/or a sign. What about the Sam D. Horse Community Center? 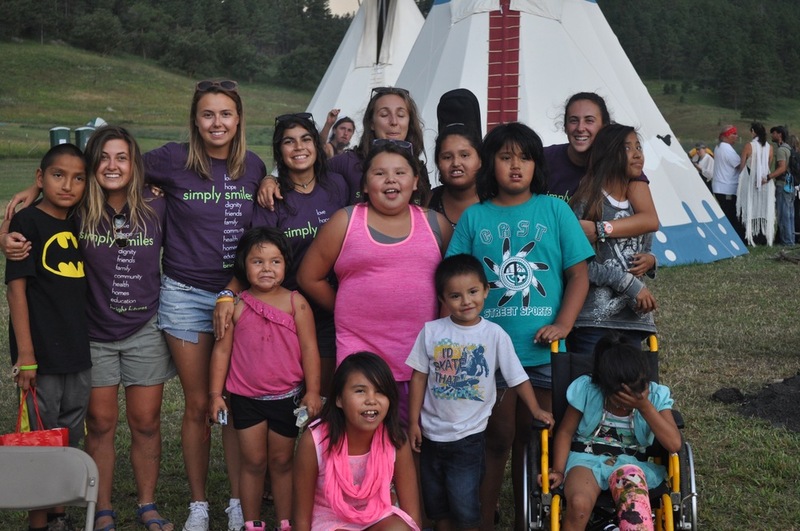 Simply Smiles will continue to use the Community Center as the center of all Simply Smiles does on the Reservation. Because of the generosity of Simply Smiles supporters, volunteers, and our partners on the Reservation, we have invested a lot of energy and funding into make the community center in La Plant what it is today. What we build on the new land will be an expansion of the community center infrastructure we've already built. You are leasing the land from a church group. Is Simply Smiles still a non-religious organization? Yes. Simply Smiles is not officially connected to any one religion, faith, or belief system. We want to be able to work with anyone who shares our values and our vision. Remaining independent in this way is a central tenant to Simply Smiles programing being open, available, and feeling comfortable for everyone. Why did Simply Smiles lease the land and not buy it outright? We chose to lease the land and not buy it out of respect for the Lakota owners of the land. We wanted to make sure that in all of our actions that Simply Smiles is supporting and giving, not taking anything from the Lakota people. By leasing the property, the land stays in the ownership of Lakota people. Simply Smiles is leasing the land from the Dakota Association of the United Church of Christ for a term of 99 years. The lease began on June 1, 2018. Over these years, we will use the land to further the vision and mission of Simply Smiles. Where is the leased property exactly? The leased property is 8.04 acres and it lies between the Sam D. Horse Community Center land and Main St. The eastern border is the old Iowa Ave, adjacent to the community center. Access is along the western border on Main St, just south of the Congregational Church entrance. Absolutely! The land is deeded/fee/non-trust land and a full year of effort was put into making sure the property was cleanly and legally owned by the Dakota Association and that they had the right to lease the land. The land was platted/surveyed, title checks were run, title insurance was secured, and multiple law firms supported the effort. We then developed a lease that protected both parties. All the legal ducks are neatly in a row making sure the land holding is stable for the next 99 years. Will there be any Lakota ceremonies performed to bless the land? We would love your input and help to make sure that before we break ground on the first building that we have honored the traditions and practices for a situation like this. On June 3, 2018, the Dakota Association of the United Church of Christ held a church service and blessing at the Virgin Creek (La Plant) Congregational Church. Deepening partnerships: Bryan Nurnberger (left), Simply Smiles President and Founder and Toni Buffalo (right), Administrator of the Dakota Association of the United Church of Christ sign the 99-year lease agreement, allowing Simply Smiles to continue and expand its programming on the Cheyenne River Sioux Tribe Reservation in South Dakota. voices of lakota youth: "rides on the enemy without fear"
In honor of the Native Nations March in Washington, D.C. today, we wanted to share with you the perspective of Kayson, a Lakota teenager living on the Cheyenne River Reservation whom we have been fortunate to know since we began our partnership on the Reservation. Kayson spent the entire fall and winter of 2016 on the Standing Rock Reservation, serving as a water protector and resisting against the Dakota Access Pipeline. In those months, he experienced the joy of different indigenous nations from across the globe coming together juxtaposed with the brutality of people driven by greed and destruction. During a recent trip to the Reservation in late February, we asked Kayson to share his thoughts on what living at camp was like, how it changed him, and what's next for him as a Lakota youth. In a ceremony later this year, Kayson will be honored and given a Lakota name, which, fittingly, translates to "Rides on the Enemy Without Fear." it was a feeling of welcoming, and the people were so nice to each other. i was there when the camp was still young. i was a boy then, and now i'm a man. i learned the ways of my religion and that's Lakota. i rode horses there. i rode with the riders i call brothers now. we are all in this fight together. we have to fight for what's right. and the people would enjoy the ways of many different tribes. there were round dances and singing contests and volleyball and basketball. it was a hard day that i was riding with my brothers to fight the black snake. i watched the cops hurting my people. they showed no fear against my people, and i was a little scared. they used concussion grenades against us, had weapons. we had no weapons, we were unarmed. that did not matter to them. i watched the people getting hurt by the police. then my brother told us to go with him, so we did the buffalo run and we herded those buffalo. we heard the screams of joy from our people, we gave them hope and they did not give up. they fought hard that day. i'm proud to be Lakota. i'm proud of my people that fought with us that day. my next fight is with the kxl pipeline. that'll be in bridger, SD. and i wanna bring as many people to fight with us. we stood with standing rock. now it's time to stand with cheyenne river. that's what we gotta do. i am a protector of mother earth. it's my calling to do so. i'll have my brothers next to me fighting this pipeline. i thank you guys for the support and hopefully we will see you there. **You can read more about the events of October 27, 2016 and the subsequent detainment of water protectors here and here. STAY INFORMED. Learn more about the Native Nations Rise March and its aims here and here. • You can follow the march and subsequent actions by following the hashtags #NativeNationsRise, #NativeNationsMarch, #IndigenousRising, #NoDAPL and #WaterIsLife on social media. • Read the latest news about the Dakota Access Pipeline here. TAKE ACTION. Learn how your members of Congress have voted on issues that affect Native Americans -- and encourage them to support indigenous rights with upcoming legislation -- here. VOLUNTEER WITH SIMPLY SMILES. You can meet the amazing Lakota youth that we support on the Cheyenne River Reservation in South Dakota. Click on the button below to learn more and get started! Field Notes From Mexico: More Than Just "Deworming"
This latest edition of Field Notes comes from Simply Smiles President & Founder, Bryan Nurnberger. Bryan is currently visiting Simply Smiles program locations in Oaxaca, Mexico where he helped to staff a medical clinic. 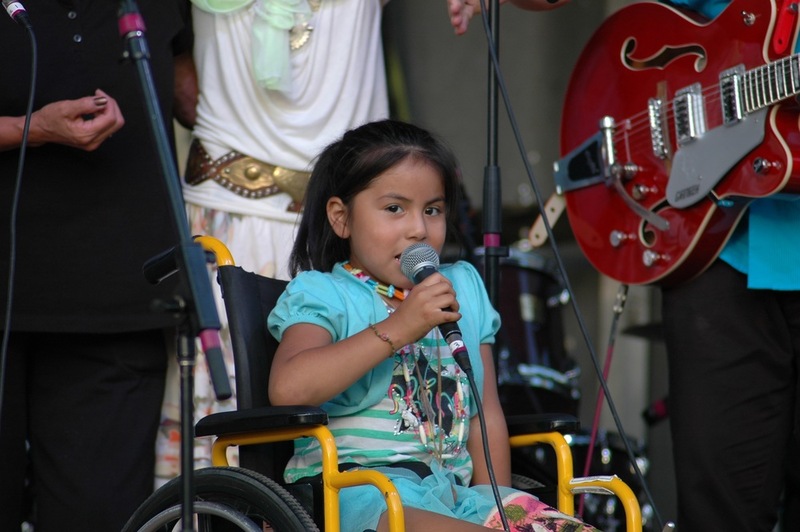 In Oaxaca, Mexico, 2,504 people just received treatment for parasitic infection from Simply Smiles. At the same time, we distributed over 12 tons of food staples, began construction on 14 more latrines and announced the opportunity for children to be educated from kindergarten through the college level at our our new “Casa Hogar Simply Smiles Children’s Home”. Efforts to treat populations for parasitic infection, or “deworming” programs as they are often called, are one of the most impactful and most common actions taken by governments and NGOs in impoverished areas. While deworming efforts are extremely common around the world, they are almost always done in a manner that is not in keeping with the principles upon which Simply Smiles bases our work. For example, in the village where our Director of Oaxacan Operations, Gabriela Chavez Hernandez, grew up, strangers would show up every six months, pass out pills to treat for parasites and leave. This “treatment only” approach is the global norm because it’s easy to execute and the relatively low cost of the medicine makes indefinite treatment possible - but it is clearly not a solution to the problem. Treatment only perpetuates a system of dependency and is a disrespectful way to support individuals in need. If the reader feels conflicted or unsure about the definitive nature of this statement consider this scenario: If your own child continuously suffered with an ailment that left him malnourished, in pain, and at risk of death from blocked intestines would you rather A) provide temporary relief twice a year forever or B) address the root cause of the ailment and cure your child permanently? Treatment only approaches dictate that answer A is what parents want for their children. Simply Smiles, and every parent with a choice, chooses answer B - a permanent and respectful cure. Simply Smiles President & Founder, Bryan Nurnberger with one of the children he encountered on his first trip to the Oaxacan villages. At the time, Rigoberto was suffering from severe parasitic infection. Pictured here at Thursday's clinic (5/26/16) Rigoberto is healthy and attending one of the schools Simply Smiles built in the region. Since 2009, Simply Smiles has been working in an extremely remote mountainous area of Oaxaca, Mexico. Here we encountered poverty that was nothing less than stunning. The globalization of the coffee market over the past decades left the population of Zapotec Indians, who have lived here for centuries, in a state of near starvation. During our first visit to the region, the ubiquitous distended and hardened bellies made it immediately clear that there was also an extremely high rate of parasitic infection. While our initial response to this humanitarian emergency was swift, Simply Smiles waited until 2013 to address what we soon learned was specifically parasitic round worm infection. Why? So that we could do it right. Because truly eradicating parasitic infection necessitates complete trust from, and partnership with, the population in need. And that takes time and effort to build. So for four years we built trust by focusing on other needs in the region including distributing over 2.5 million meals and building two schools. It was not until 2013 that we were in a position to begin our eradication efforts. Partnership & Trust: When there is a line of 2,500+ people, you need a lot of help to manage a clinic of this size. My wife, Kristen, and I were the only Americans staffing the event. Our partnership with the local population means that we can help the people to help themselves. Villagers managed the flow of people through the clinic, translated Zapotec to Spanish at the registration table, helped to prepare and dispense the medicine, and distributed the 12 tons of food staples that are given at every clinic we host. Treatment: Twice a year Simply Smiles hosts a medical clinic where the population is treated for parasitic infection with the highest quality name-brand medication. Education: Because Simply Smiles built two schools in the region we are able to fold educational programs about how to prevent parasitic infection in the curricula. We’ve distributed thousands of informational pamphlets and hung innumerable signs. A doctor and/or nurse sees every single individual as they come through the clinics to explain what the treatment is for and why it is important. Prevention: One contracts round worm from contact with feces, either through lack of hand washing or as a result of open defecation. Each person receives a large bag of soap when they pass through the clinic along with instruction on how to effectively wash your hands. In an area without plumbing, construction of basic pit latrines is an economical and extremely effective way to provide sanitary facilities. To receive a latrine from Simply Smiles, a family signs out shovels and picks and then digs a 3 meter deep hole. Once completed, Simply Smiles sends our local construction workers to build a brick latrine on top of the hole. These latrines have an estimated lifespan of over 40 years. This week, we began construction of 14 additional latrines. Scientifically Proven Results: Simply Smiles has partnered with American and Mexican universities and pharmaceutical companies to formulate and execute our unique holistic program to eradicate parasitic infection. At the end of each calendar year, medical professionals including an infectious disease specialist, travel to Oaxaca and test stool samples from 10% of the region’s children. In 2013 the results showed a 48% infection rate. By 2015, that infection rate had dropped to 20%. Our next scientific testing will take place in November of 2016. We are hopeful that we will see an infection rate of less than 10%. Simply Smiles, of course, will continue our efforts until eradication has been achieved and sustained. The children, families and communities in our care deserve nothing less. For more information and photos, please visit our More Than Just Deworming webpage. Simply Smiles President & Founder, Bryan Nurnberger, is currently on a two-week visit to our programs in Oaxaca, Mexico. He sent us this dispatch from the place where Simply Smiles began and reflects on the theme of gratitude and its prominent place in our organization's history. This morning, walking through a barrio of rusted tin houses, rutted dirt roads, and skeleton thin dogs, the smell of raw sewage triggered a part of my consciousness that reminded me of how much time I’ve spent in places like this. Open doors reveal glimpses of lives I can never really understand. My relative privilege has made that impossible. The most I can hope for is empathy… But I know an injustice when it is in front of me. A view of some of the 27 brightly colored homes that Simply Smiles has built in the barrio within the Oaxaca City garbage dump. I’ve seen newborn babies born into environments completely devoid of hope. I’ve listened to so many stories of hardship, of suffering and of loss that they would be impossible to recount. I’ve felt the bone chilling cold inside a trailer home as a family gathered around an open oven door for warmth. In a garbage dump, where hundreds of people were living, I’ve smelled air so tainted with decomposing trash that it seemed too thick to be inhaled. Places like Oaxaca, Mexico and the Cheyenne River Reservation in South Dakota fill my senses. And when I first began Simply Smiles, the chemistry of combining overwhelming sights, sounds, smells and touches caused a profound reaction: Fear. It was fear that populated my fifth sense as I tasted its tartness in my mouth. But it wasn’t a fear of physical or emotional harm. Nor was it a fear that I would somehow find myself forced to live and suffer in these places. Rather, it was a fear that I wouldn’t have the ability respond to what I was experiencing. It was a fear that I wouldn’t be able to help. I was scared of my position as a conduit between those in need and those who could give. I was petrified that nobody would respond to my stories of the realities on that Indian reservation or in those villages in Mexico. Since 2003, nearly ten-thousand of you have responded. You’ve given hundreds of thousands of volunteer hours and donated millions of dollars. We’ve laid countless injustices at your feet and your response has been so generous that it sometimes feels unbelievable, like this has all been some kind of inspired dream. But when I’m in places like this, living with those that Simply Smiles exists to serve, my senses are once again filled as I experience the depth and breadth of the the impact you have had - it’s indeed real, it’s tangible, and it has changed so many lives. I have to be honest, I’m still scared. When you’re the one who tells the parents; “everything will be alright, we’re going to help you” the fear of not being able to fulfill that promise will always, to some degree, be part of the reality. However, that fear is now abated by confidence. A confidence that you provide with each offering of support to Simply Smiles. I went to bed that night with no fear at all. 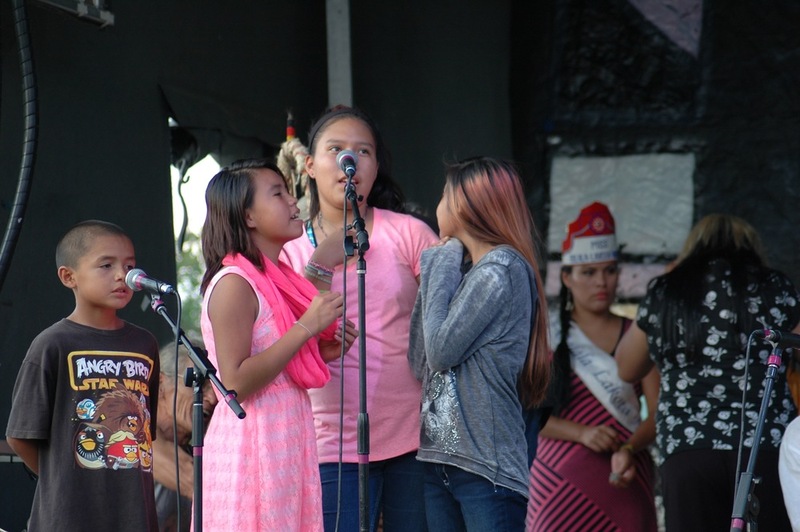 Field Notes from the Reservation: The La Plant Music Camp rocks the Unity Concert in the Black Hills! The word "proud" doesn't even begin to sum up how we felt about the experience. The kids performed with a confidence that even seasoned performers envy. Their voices were clear, their energy was high. In short: They nailed it! 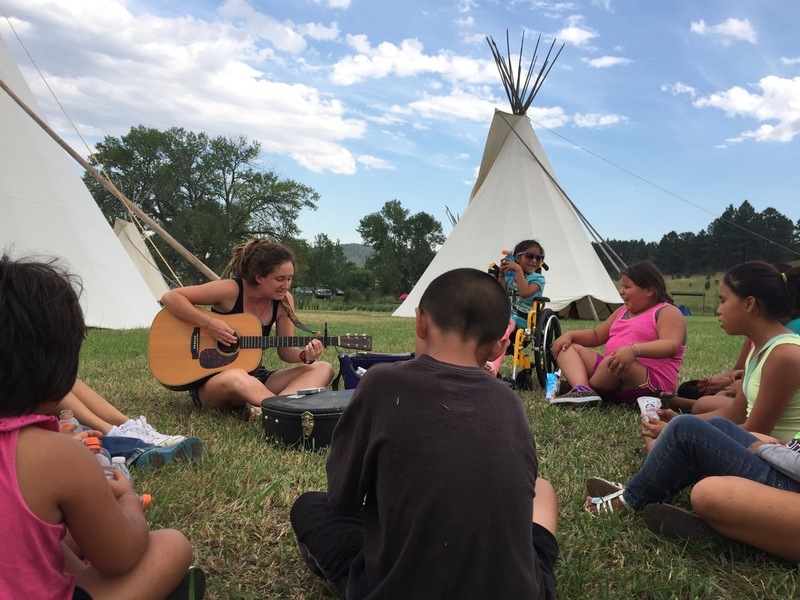 Unity Concert organizer and musician Bethany Yarrow noted that the La Plant Music Camp kids were the highlight of the three-day performances. The crowd even requested an encore! It was a long, exciting, magical day for all of us. As we drove the bus back to La Plant, the kids giggled, started impromptu, silly verses of "This Little Light of Mine," and many eventually succumbed to their exhaustion, with big, contented smiles on their faces. It was truly the perfect, celebratory punctuation to the end of our time on the Reservation for the 2015 summer season. 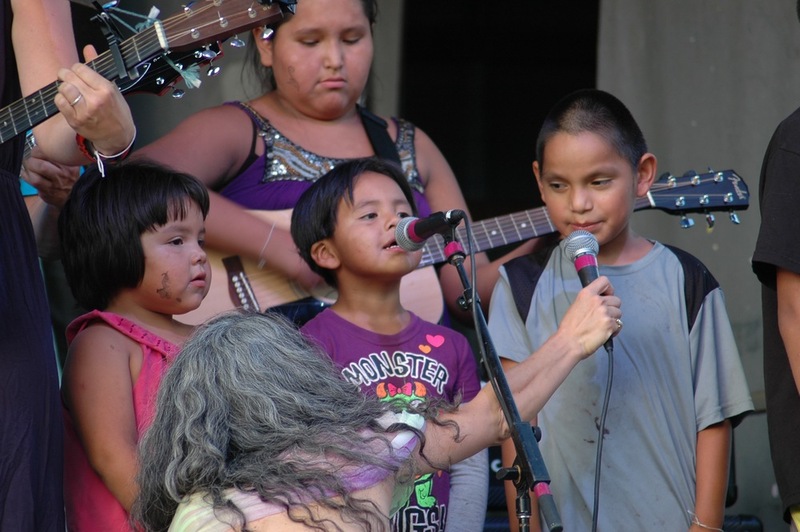 In many ways, this performance is just the beginning of future musical endeavors for the La Plant Music Camp. A big, big "thank you" to Kristen Graves for spearheading and inspiring Music Camp, and to Peter Yarrow, Bethany Yarrow, and the organizers of the Unity Concert for making this opportunity possible for the La Plant kids! 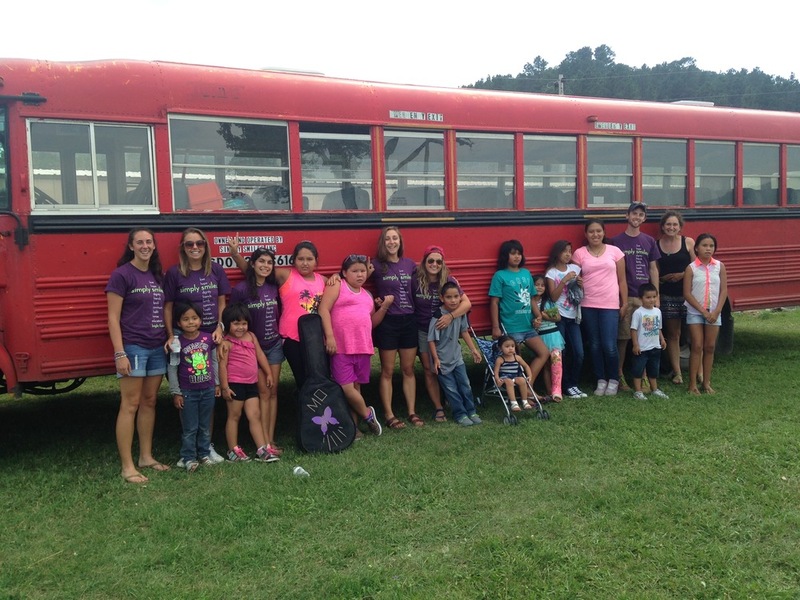 And, a HUGE "thank you" to members of the Simply Smiles family for supporting and nurturing fun, unique, and monumental excursions like this for the children and their families on the Reservation. And, of course, thanks to the La Plant Music Camp kids for rockin' on! Today, Tuesday August 19th, was another great day in La Plant. After our usual walk-on at the local track, the volunteers and staff enjoyed a delicious breakfast of fruit and waffles and then got right down to work. Projects today included work on our whimsical garden path, priming the garden shed, placing posts in the new horseshoe pit, and painting lines on the new basketball court. It was a hot day but everyone’s work ethics prevailed and we got a lot done! Then, the kids’ summer camp was held in the community center. There were many fun activities to try, including a dunking contest and the longest kickball game that I have ever participated in. Tuesday night is bingo night in La Plant! Although the power in the community center was out, a big crowd turned out to get together and win prizes. The town also celebrated Zach’s birthday with a special song by Kristen Graves and thanked him for all his hard work as a staff member of Simply Smiles. A fun time was had by all this evening in La Plant as we looked back on all that was accomplished today. Watching the many partially-finished projects we arrived to become finished products was extremely rewarding for the volunteer group. Note: This entry is being posted a day late due to a loss of power at the community center last night, but the power is now back on! August 13-17, 2014 OK, so this has taken me a few days to finish … but in my defense we were REALLY busy on the Rez! First, a little about our group … we have 15 people altogether; 6 teens, 9 adults (7 men and 8 women). Many of us have been out here previously (the 4th time for some), but for several this is their first (but hopefully not last) time here. We’ve broken up into 4 work teams: Scott, Clark and Evan are making a tool shed complete with a window and hinged doors; Debbie, Bruce and Lynne are fencing in the “washing area” - they’re working on creating gates to keep it secure; Tom, Sherrie, Erica and Sam are putting the finishing touches on a recycling bin and a baseball equipment bin; Rob, Glenn, Olivia and Janet have been digging holes - first for the basketball court and now for the horseshoe pits. As for me, I’m working with a staff member (Jen from First Church in Fairfield) to make a barrier around the basketball court so no one can drive on it. Whew! I have to say the basketball court is epic! It was started earlier in the season but we finished pouring the cement for it this week. We hope to pour the concrete for the hoops tomorrow. And the kids are very excited about being able to play on it soon! Speaking of kids - it’s fun to see many familiar faces and meet many new ones too. We’ve had great attendance at camp … our first day was all about drawing and each kid got their own sketch pad and many sat for the whole afternoon making various pictures. They also used some “Draw 50 …” books to make great pictures - one had instructions on drawing Fred Flintstone and several kids drew him really well! We heard later in the week that one of the kids carried his sketch pad with him for days drawing all sorts of things and that his Dad bought him some art supplies so he can continue to improve – way cool! Some of our other crafts were “sponge bombs” which were great on the hottest day of the week and using a t-shirt transfer machine to make backpacks for kids using their own drawings. 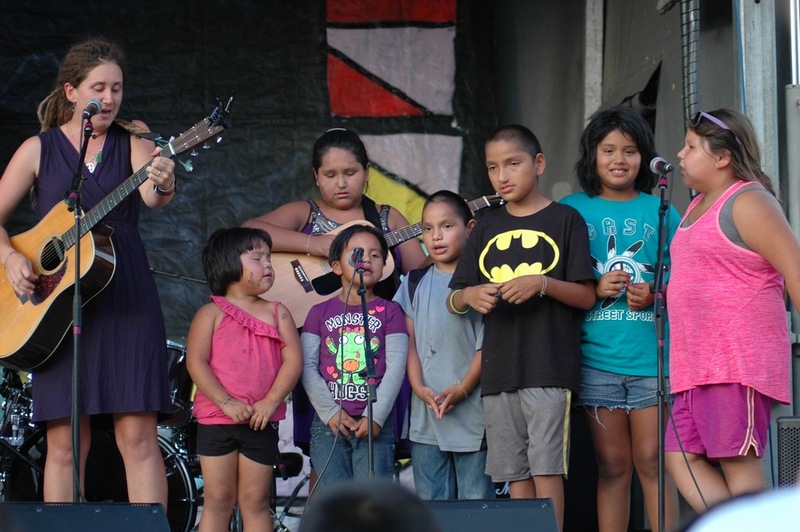 Since we had not one but THREE talented musicians in our midst (Kristen Graves, Glenn Roth and Tiokasin Ghosthorse), we had a fabulous concert under the stars during the community dinner on Friday night. Lakita and Juanita even went up and sang “Let It Go” from Frozen as well as “Keep Hope Alive” in front of a very appreciative crowd. Although we’re home now (and are no longer covered in grime! ), we will not forget the awesome experience that is uniquely Simply Smiles! See you next year, LaPlant! Driving back into the reservation, you expect to see changes to the land -- whether that be more houses or more additions to the Community Center; however, what we weren’t expecting to see is a brighter, happier community that has withstood more than just physical transformations. An update from Gaby: "Be proud, work hard, and be confident"
"Be proud, work hard and be confident" was the advice that I got from my grandfather at age 11 when I left my village and moved to Oaxaca city to be able to continue with my education. As I attended middle and high school in the city I dreamed of the day I would make it to college. I wanted to study, and I was confident that one day I would be able to receive a college diploma. Today’s work on the reservation began with the continuation of the projects we began yesterday. For my group, that meant mixing and pouring concrete for the new horseshoe pit. The other volunteers worked on either adding new tiles to the floor of the community center or fixing the water pipe. Then, after several hours of work and breaks for water and meals, summer camp started. It is a privilege to be able to help people. This thought has bubbled to the surface many times over the course of this week, especially as we prepare to wake early tomorrow morning, pack our bags, and return to our “first world” lives—with insulated houses, and beds of our own, and personal space, and financial security. Twelve hours after leaving Wapping, the four of us arrived in La Plant, sharing thoughts of how South Dakota, and more specifically the CRST Reservation, matched our anticipations. Every week, the food and garden projects grow in La Plant. When we arrived on the Reservation at the end of April, we were welcomed by a dismal scene: dilapidated, shredded greenhouse tents, lots of debris scattered around the garden, cold temperatures and, of course, tons of muddy, gumbo soil. Yet, as June begins, the garden project is quite a different picture. It's one of progress, one of hope and one soon to be filled with delicious, nourishing food. As I sit here on our last night pondering what to blog about, all I think about is the fact that I am TIRED. And then I stop. And reflect. This was just a week for me. For the residents of La Plant, it is every day. Tomorrow will be the last day for me working on the reservation. I have had ample time to reflect on my experience and what I will take from working with the resilient people of the Lakota Nation. Resilient is an interesting choice of words for me to use. As a helping professional, I have dedicated my life to working with people from different backgrounds and stories, but I have never worked with people that have a history quite like the Lakota. Today was a really good day. Throughout the morning and early afternoon we worked on our construction projects around the community center. Sam Dunn and I persevered with the compost bin project. Today was an exciting third day in La Plant. For Olivia and myself today’s schedule was different from our usual schedule while here in La Plant. It’s Monday evening, and our first day of camp is over and the community center has calmed down! We had a great camp day, we made flubber and slime, played games, made puzzles and colored pictures but the best part was getting to talk to the kids. It’s great to see how much they’ve grown and changed this past year. I have had the most amazing experience here this week! There was so much to do in one week. We would be working on the house rain or shine in the mourning only to be covered in liquid nail and saw dust. Playing with the kids at Summer Camp was so fun!